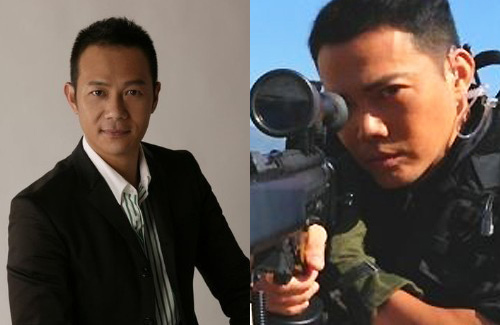 Since December, Sniper Attack 2013’s <神槍狙擊2013> filming has proceeded briskly. Michael Tse (謝天華), Eddie Cheung (張兆輝), Vincent Lam (林偉), Otto Chan (陳志健), and Alan Wan (溫家偉) filmed a SDU rescue operation and explosion scene today. The cast filmed at a deserted school in Fanling, New Territories. Aside from brazing bullets and mosquitoes, the actors climbed walls and threw themselves on the ground in the action-packed scenes. Eddie was dressed in full gear and carried a rifle, while Michael appeared in a light-weight jacket carrying binoculars from his sniper lookout position. More challenging material, including a Presidential assassination and bed scenes await Michael. “I don’t know who my partner will be yet. The most important thing is the action first, not the love action scenes,” Michael joked. On a more serious note, Michael discussed good friend, Bobby Au Yeung’s (歐陽震華) condition since entering the hospital last week. Feeling better in the last few days, Bobby has taken visitors at the hospital and started returning missed calls. Although Michael was present on the evening when Bobby suffered from an acute pneumonia attack, Michael had left the house party early and did know all the details of the incident. “I don’t know who my partner will be yet. The most important thing is the action first, not the love action scenes,” Michael joked. Lol. TVB probably hasn’t finished writing the script yet. Wish they could be a bit more professional and complete a script/revise it for quality before rushing it out. Or at the very least, if it is complete, give it to the actors ahead of time so they can study it and understand their character more instead of giving them a day or two to learn the lines and know what’s coming. I do agree with him though, who cares about the love scenes (I fast forward through that crud anyway), as long as the action doesn’t look lame.